For more than a century, Robinson Brick Company has manufactured the most beautiful collection of brick colors and textures in the world. Choosing Robinson Brick™ means that you demand lasting value, exceptional quality and unique choices. 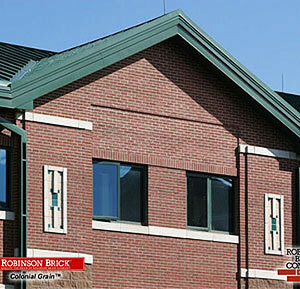 Robinson Brick Company offers a broad spectrum of architectural brick colors to compliment any design style. Produced under the stringent quality guidelines of ISO 9001, our quality exceeds ASTM's highest standards for Type FBX, Grade SW brick. Our Architectural Classics line of brick colors provide aesthetic excellence and accurate, repeatable colors ensuring maximum usage.